Penny and I have been leaning in a Paleo direction lately. I’d been controlling calories pretty well but not eating enough quality stuff. She needed to get jump-started. This recipe popped up on Facebook and then popped up on my dinner table recently. Slice peppers in half lengthwise, remove ribs and seeds.In a large sauté pan over low-medium heat, add butter, olive oil, garlic, mushrooms onions and a little salt and pepper. Sauté until onions and mushroom are nice and caramelized. About 30 minutes.Preheat oven to 400°Slice roast beef into thin strips and add to the onion/mushroom mixture. Allow to cook 5-10 minutes.Line the inside of each pepper with a slice of provolone cheese. Fill each pepper with meat mixture until they are nearly overflowing. 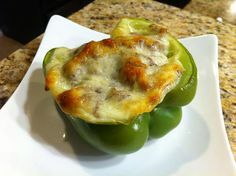 Top each pepper with another slice of provolone cheese.Bake for 15-20 minutes until the cheese on top is golden brown. Here’s the beauty of the thing. They come in at between 300 and 400 calories per pepper. We scaled ours back from the recipe above by cutting back a bit on the main calorie culprits: the cheese, butter, and oil. For that modest count, you get some terrific cheese, some savory meat, and the decadent feel of butter. What’s not to love. Yes, you have something like 18 g of fat here, but that’s not a day-killing amount, provided you don’t eat biscuits and gravy for your other two meals. You get a reasonable measure of carbs but 30 g of protein. Throw in the fact that you’ll have the righteous feel of that half green pepper with all its vitaminy goodness, and this is a guilt-free indulgence. Food was made for the person; not the other way around. I intend to enjoy my food while still eating wisely.